This Tuesday, July 1st – the third of Tammuz on the Hebrew calendar – marks twenty years since the passing of the Lubavitcher Rebbe, of righteous memory. Though it has been two decades, his presence is felt stronger than ever. His teachings continue to inspire and guide and his insights remain as fresh and relevant as if they were given today. We invite you to learn more about the Rebbe, his life and teachings and the impact he continues to have today, at the newly relaunched TheRebbe.org site. “The irony is where are Jews safest and where are Jews essentially being … “Culturally, it’s the greatest moment in Jewish life I’ve ever had.”. … a number of concerts to “revive Jewish heritage” for future generations. … to new ideas … and to revel in the joy of Jewish learning and Jewish life.”. When Helena Levine, the incoming head of school for Donna Klein Jewish Academy (DKJA), first visited DKJA — the … The school is now my life. “I don’t really meet Jewish people in everyday life; I don’t go to Jewish events and my social circle isn’t particularly Jewish. My friend was on JDate and .. Please Share Video with as many people as possible. Kelowna’s Summerhill Pyramid Wine has produced ‘Tiferet’: Canada’s first uncooked 100% Kosher wine. Fired Up Catering’s Chef Marat Dreyshner talks about Tiferet and shows Fiona Frobes of The Rush how to create an easy and delicious meal that could be part of any Kosher dinner. Shabbat Recipes: OK to Read on the Day? Is it OK to Read Shabbat Recipes on Shabbat? In this video, Rabbi Chaim Brovender explains why reading cookbooks falls into the category of “Shitrei Hediyotot”. Cookbooks, he explains, are for the explicit purpose of preparing food, which is an activity forbidden on Shabbat, and so this prohibition is in place regardless whether the intention of the reader is to cook something from the book after Shabbat or not. With the Jewish people praying for the safe return of the three kidnapped yeshiva students #EyalGiladNaftali, Rabbi Chaim Mintz, founder and leader of Oorah, gives insight into what we can do to #bringbackourboys. May his timeless message bring inspiration to the Jewish nation during this time of pain. Learn more about Oorah and its programs on http://www.oorah.org. יהודי תימן – הסרט המלא! Moishe House, a pluralistic international organization, provides meaningful Jewish experiences to young adults in their 20s. Our innovative model trains, supports and sponsors young Jewish leaders as they create vibrant home-based communities for themselves and their peers. (Chabad.org) In preparation for the 20th yahrtzeit (anniversary of passing) of the Lubavitcher Rebbe—Rabbi Menachem M. Schneerson, of righteous memory—on the third of the JeRabbi Menachem Mendel Schneerson, known as the Lubavitcher Rebbe, is widely considered the most influential rabbi in modern history. 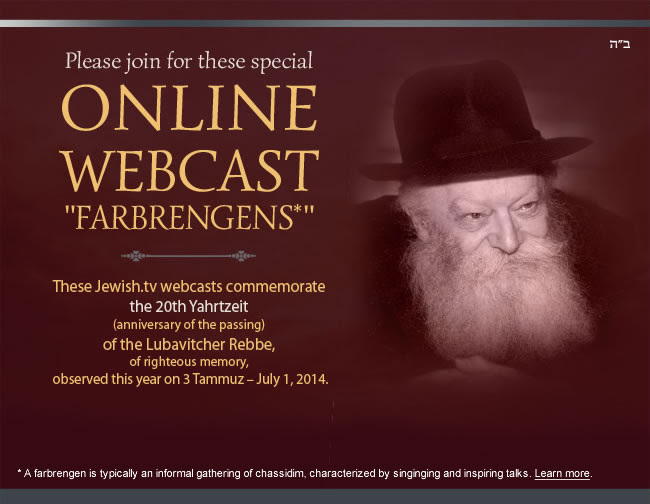 more…..
Commemorating the anniversary of the passing of the Rebbe, Rabbi Menachem M. Schneerson, of righteous memory. Is it good for the Jews or bad for the Jews? … by right-wing parties and set off alarm bells among Jewish communities around Europe and the world. Did you miss out on “The Pin” premiere at the Anne Frank Center? Check out the highlights from that fantastic evening! Two young people find love while in hiding during WWII. The boy, now an old man, works as a Shomer, a religious watchman responsible for guarding the souls of the dead before their burial. One night he comes face-to-face with his long lost love when her dead body is wheeled into the morgue where he works. As he is presented with a final chance at redemption, he recalls the brief but intense circumstances of their love affair. WEST NYACK – Three teens are the focus of a massive search in and around Israel’s West Bank after they were allegedly captured by Palestinians. The non-Jewish founder and director of the Jewish Culture Festival in Krakow, Poland, Janusz Makuch sits to discuss his connection to the Jewish heritage and how he came to create one of the largest Jewish culture festivals in the world. With Mark S. Golub on LChayim. This short film is part of the San Francisco Jewish Film Festival short film showcase program, SFJFF Presents. To discover more great Jewish short films each month, join the SFJFF YouTube channel by clicking the red SUBSCRIBE button above. For more details about SFJFF films and programs, visit http://www/sfjff.org. Remembering Eli Wallach, Yiddish Theater Champion. By Masha … “We were the onlyJewish family in Red Hook in a sea of Italians,” he once said. The fifth-annual Summer Celebration of Jewish Music is a series with sources as diverse as Korngold, klezmer, Israeli dance and Yiddish cabaret. The Cleveland Jewish News captured seven awards in the Press Club of Cleveland’s Excellence in Journalism Awards, announced last week. Go here to view this email online. FESTIVAL TICKET OFFICE IS OPEN FOR YOU! Festival is held under the honorary patronage of H.E. Bronisław Komorowski President of the Republic of Poland. Małopolska Region is the main partner of the festival. Three yeshiva students from Kfar Etzion are missing and believed to be kidnapped. A massive IDF operation is currently underway. We pray for the students’ safe and quick return. If we have not received good news by later today, please take a moment when lighting Shabbos candles to think about them and recite Tehillim chapter #121. Compliments to Chabad California for the first 4 minutes of the video clip of the Rebbe. Jerry Seinfeld, Larry David, Dave Foley, and Martin Short contribute to this hilarious must-see documentary. David Steinberg—aptly described as a cross between Woody Allen and Lenny Bruce—took the comedy world by storm in the 1960s. Steinberg’s satiric, literate and defiantly Jewish material landed him on Nixon’s enemies list and on Johnny Carson’s Tonight Show couch more than 100 times (second only to Bob Hope). Today, Steinberg is a sought after comedy director. Although the Central Conference of American Rabbis voted in favor, it would be 50 years before the first female rabbi was ordained. By David B.
Reuchlin is considered a hero in the history of European Judaism.” 1651: During … 1866:Today, in Romania, Jews were attacked maimed and robbed.